In his formative years, Divjot Singh attended various schools across cities because of his father’s transferable job as a government employee. This helped to develop his ability to quickly adapt to changing situations, an essential quality in management professionals. Pursuing Bachelor’s in Commerce, Divjot gradually developed interest in Finance. To gain exposure to the corporate world and to make a career in Finance, he enrolled with FORE School of Management, New Delhi. The B-School helped to further develop his interest in the chosen domain and hone the skills needed to excel in his professional journey. 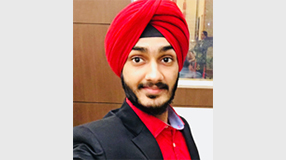 He believes that the training he imbibed during internship with the boutique investment bank Four-S Services, Gurugram was the key to his getting placed with Citicorp Finance India Limited. Getting the opportunity to work as an Assistant Manager in Securities Services with the renowned firm, he is confident about making his mark in the domain he is passionate about. What went through your mind after getting selected by Citicorp Finance India Limited? I was happy inside, but tears were rolling down my face. The journey was hard and intense. I am extremely proud of my parents, who have always showed me the right path, especially when the going became difficult or unfavourable. My father was the first person I called when I heard about the placement. He was proud of my selection. But he reminded me that the road is long and success depends on the contribution of others as well. His wisdom has always kept me grounded. Can you take us through the placement process and share with us what you did differently to bag the placement? After the initial screening, there were two gruelling interviews. Instead of rapid fire questions, they were more like dialogues. It gave me the opportunity to express my desire to work for the company and ask questions about the role I was being offered. I think interviewers look for two important qualities: commitment and vigour. I was able to showcase both these traits through my internship experience, which was the key to my success. Can you elaborate on the last thought? Where did you pursue your internship and how did it mould you as a professional? The two months of internship at Four-S Services, Gurugram, a boutique investment bank, brought about a paradigm shift in my life. I used to put in 12–14 hours every day to meet deadlines. On one occasion, when a client needed a report the next day, I worked for 26 hours straight in the office to finish the presentation that I had to make in the morning. My two years at FORE School of Management equipped me to take on challenges outside the campus and perform with energy and vigour. Any particular learning experience at FORE School of Management that you hold dear and believe has made you the professional you are today? Feel everything I have done since walking into the campus for the first time has led me to where I am today. In particular, being a member of the integral committee of Corporate Interaction Division was a huge learning experience. I was responsible for organizing corporate events and reaching out to industry professionals. This exposure immensely boosted my confidence, which, I think, my recruiters could make out. Now that you have embarked on your professional journey, have you set yourself any immediate goal? As an Assistant Manager in Securities Services with Citicorp Finance India Limited, I will have to prepare and review financial statements or regulatory reports of institutional clients based in foreign markets. I will also be responsible for ensuring process initiatives, pursuing continuous quality improvement, and acting as a subject matter expert for the team. I don’t want to start with too many expectations right now. I would like to work in a productive environment as I learn and deliver to the best of my abilities. Do you have any advice for juniors who want to work in Finance, the domain you are passionate about? Feel quality internship experience holds the key to corporate exposure. If you don’t have any experience in Finance, you must build your skill set by interning with a company which offers a profile in that domain. Give your all to the internship and perform to the best of your abilities because this is something that will set you apart during the selection process. I think this really worked for me.